Once in a while, I get a chocolate craving (actually, that would be every few hours)… and believe it or not, sometimes, I don’t feel like baking. So I hop in the car, drive down the street, and buy a Brownie Marshmallow Cookie from Cutler’s Cookies. It sets me back a whole dollar. Cutler’s is a cute little sandwich /cookie shop in Bountiful. They make a variety of delish cookies. If I’m going to eat a store bought cookie, Cutler’s is the place. This one is my all time fave. I love chocolate and marshmallow together. There is a yummy Rocky Road Brownie I like to make, but I’m the only one in my family who loves it, and they are a little hard to cut. Not that it has ever stopped me from actually getting the brownies out of the pan and consuming far too many over the course of a day. This recipe is from Claudine; a well known amazing cook/baker in our neighborhood. When my oldest son Stephen was about 8, he came home from playing with Claudine’s son, Matt. 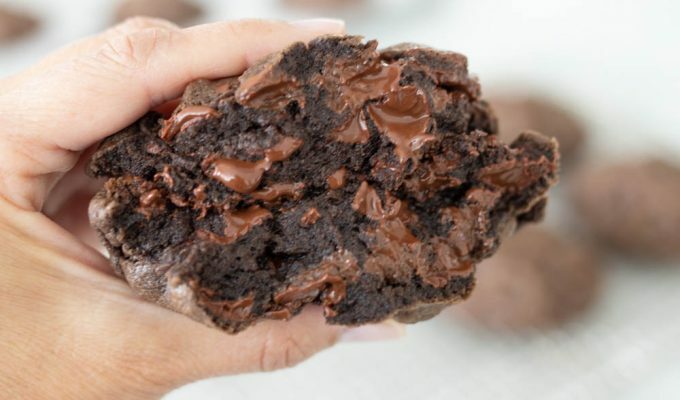 He said, “Mom, I decided you are the best cook of regular food, but Matt’s mom is the best cook of sweet food!” Try these out next time you get a chocolate marshmallow craving. Beat egg and sugar until fluffy. Add vanilla, shortening and melted chocolate. Blend well. Combine all dry ingredients into small bowl. Add dry ingredients alternately with milk to chocolate mixture. If using, add nuts. Drop by tablespoons onto greased cookie sheet. Bake at 350 degrees for about 8-10 minutes. When the cookies are almost done cooking, remove from oven and place 1/2 of a large marshmallow on top of each cookie. Return to oven for about 1 minute or just until marshmallow puffs. Remove from oven, flatten marshmallow with the back of a wooden spoon or spatula. Cool completely. Frost with chocolate frosting. Beat softened butter in bowl. Add vanilla. Slowly beat in cocoa, powdered sugar, milk or half and half. If needed, add more milk, a little at a time. Si, Wow! thank you so much for the kind words. When we aren’t busy baking cookies here, we’re looking at food on the internet, your site is always a favorite. Ok, I don’t know if you will see this comment, but it’s so funny you posted these because it’s my post for friday!! What’s even more funny is I thought I was the only one making up this recipe! It was a cookie from when I was little… well, you’ll just have to read my post fri. Haha I love it! Wowzers – I made these yesterday and they were DELICIOUS. Thanks for sharing!